This is NMD R2, the second model in NMD line of shoes. I have reviewed the NMD R1. You may check it out later. NMD is also known as nomad. It’s a line of shoe specifically designed for nomadic lifestyle. NMD R1 was released in 2015. Though it wasn’t endorsed by any celebrity, it gained popularity quickly. The shoe is considered one of the best Adidas lifestyle sneakers. It’s still considered by many people as their favourite lifestyle sneaker. This NMD R1 and R2 has a lot in common. The primeknit upper and the Boost midsole are very noticeable features of these lifestyle sneakers. The shoes have similar outsole and they both feature heel pull tab. This pull tab enables easy slip on and off. Obvious difference between those two models is the midsoled blocks. NMD R1 has more than one block in the midsole, but that is not the case for the NMD R2. NMD R2 features only one large midsole block in the medial side. Reviewers consider this as an advantage since it renders the shoe lightweight. However, there are reviewers that complained that the NMD R2 midsole block somehow makes their feet feel uncomfortable. 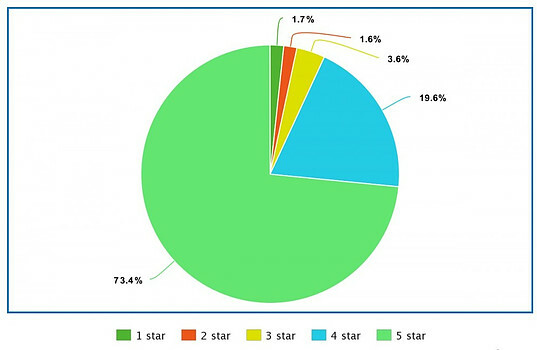 Since customer rating is such a very effective tool when it comes to making decision whether to buy a product based on it positive and negative comments, I have therefore created a pie chart of 1766 reviews from Adidas site. Apparently, 96% of the reviewers recommend the shoe and it gets 4.6 out of 5 star. Hope you find the data above helpful and useful. You may also wanna check out the video review below for some helpful information. Kaizer in his video talked about the pros and cons of the NMD R2. Some of the pros he talked about are the boost sole, the breathable material upper, the pull tab, and the tongue. Regarding the cons, he talked about the white outsole and the EVA midsole block. If you want to know what reviewers are saying, read their positive and negative opinions highlighted below. Quite a high number of reviewers gave their thoughts on the NMD R2. After going through their reviews, it’s quite obvious that most of them are happy with the shoe. They commented on the aesthetic, quality, comfort, fit, boost foam, overall feel, price, versatility, and comparison with the previous model. On the other hand, the few reviewers that are not too happy with this model commented on the fit, comparison with the previous model and how the white sole gets dirty easily. A reviewer said that the only cons is the inside material makes the shoe a bit sweaty. The Adidas NMD line of shoes is one of the most popular shoes Adidas has ever released. The popularity of the first version is still growing so does that of NMD R2. Many fans find NMD R2 very comfortable and lightweight, thanks to the boost sole and the breathable mesh upper. Some very lightweight, comfortable, and versatile shoes are hyped at a very high price but reverse is the case for the NMD R2. The price is very affordable. Reviewers commented that the shoe is a value for money. It’s worth noting that not all the fans are too happy with this new version. In comparison, some fans do prefer the NMD R1 to the NMD R2. There are other fans that are happy with the versatility, fit and overall comfort of the shoe. 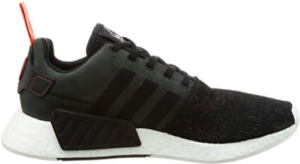 You can find NMD R2 in Amazon or Adidas. You can also find different colourways of the shoe in Foot Locker. Upper, midsole, and the outsole are usually the essential features that define a shoe. The upper covers the back of the foot, the instep, and the toe area. It is the part above the sole, usually fixed to the sole. The midsole stands as the middle layer between the outer and inner sole while the outer sole or outsole is the outer layer that directly makes contact with the ground. The outsole provides the friction that enables it to avoid slipping. It ensures surface gripping while working or running. NMD R2 features the Adidas iconic primeknit upper. It is breathable and lightweight and enable snug fit. The Adidas branding can be found on the tongue. A heel pull tab located at the back enables easy slip on and off. There are some colourways of the NMD R2 that feature graphic upper. Additional fit support is the traditional lacing system on the upper. Unlike the NMD R1, this shoe doesn’t feature any plastic eyelet. There are some reviewers that feel that the shoe is not as breathable as the previous version in the upper. However, there are others that thinks the NMD R2 is as comfortable as the best shoe can be. Just like the first version, this version features the Boost midsole. Boost cushioning is one of the Adidas most comfortable cushioning. It’s one of the best features that make Adidas Ultra Boost very comfortable and lightweight. The Boost midsole is known for it energy return ability. It is very responsive and has an excellent bouncy effect. So, it’s obviously one of the most excellent features you can find in NMD R2. The only difference I can think of is the absence of several blocks in the midsole. The Midsole on NMD R1 features more than one block in the midsole whereas the NMD R2 features only one block in the medial side. Overall, this new midsole is still as effective as the NMD R1. The presence of only one block makes the shoe more lightweight compared to its predecessor. You might have seen the outsole of the NMD R1 if you’ve read my review on the shoe. There hasn’t been any change so far. The outsole of the NMD R2 looks exactly like that of the NMD R1. This durable rubber outsole enables reliable grip and traction. Another decorative feature is the Adidas branding. Just like the NMD R1 outsole, this outsole can do well on any surface. However, the problem is the hole will allow the sole to get dirty easier. Adidas NMD R1 is the first in the line of Adidas NMD shoes. NMD means nomad and was released in 2015. Nic Galway is a veteran that works as a designer for Adidas. During the making of NMD. His vision was to design a specific shoe for urban cruising or traveling. This means the shoe will be most effective as a lifestyle shoe not as a performance shoe. When it comes to daily wear, there will be no boundary for NMD sneakers – this is the mission of Galway. When the mission of NMD started, Galway didn’t want the shoe to look exactly like the Adidas Ultra Boost. He wanted a shoe that can fit perfectly to nomadic lifestyle. However, the shoe is inspired by running shoes such as, Rising Star, Boston Super and Micro Pacer. Adidas NMD R1 wasn’t endorsed by any celebrities yet it’s popularity is very noticeable. The shoe has become the favourite of many sneakerheads, pop stars, and just anybody looking for a very comfortable shoe for traveling or daily wear. In 2016, the second version of NMD shoe was released. The shoe is the new model featuring some other improved features. NMD shoes are very popular among men and women, and they have been the favourite sneakers for many people. IT was good to learn about the NMD R2. These seem like a good fit for relaxing and a comfortable walking shoe. I have been looking into a good walking shoe. I haven’t really come to a final decision yet. 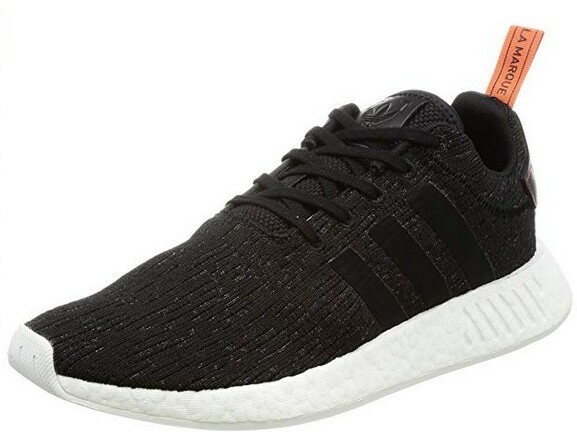 I may gove the NMD R2 a better look myself. from my own conclusion; The advantages is much more than the disadvantages; so i conclude its one of the best products. ; Although i havent used adidad nm2 before now but i can categorically tell you your review has already pushed me to order for now. Its an eye opener for me and i must commend you heavily for putting this together. Thanks for sharing this awesome post. I’m glad this review help you. Also, let me know if you have any sneaker you would like me to review. What a great review about a shoe, and just what I was needing. I have two kids and they literally go through shoes like water. I keep buying new pars all the time and sometimes I am a bit left in the dark not really knowing which would be the best. Thank you very much for sharing this, you made a mother happy! There are many shoes out there. It’s really had to know which one is good. Some good information can always help make an informed decision.